We make the process of getting a website simple, and deliver you a modern and concice way to showcase your business proudly. We believe in being honest and upfront about what we charge. With website design we reckon the clearest way we can show this is with these design packages. We can also tailor these to suit your individual needs, but these will give you a very good idea of what it'll cost to get a great website from us. This is a fantastic and inexpensive package where we provide an exciting framework for you to add your text content to. We'll set up pages, add images, contact forms and other elements. We'll also provide resources to help you write the text to be copied into your website and we'll lay it out nicely too. This package is no teaser, many small businesses have found this has suited them perfectly. With the Full Cream package we take care of the writing up your website's text. We'll also add some animation to banners and provide alternative page layouts too. You can upgrade from the Low Fat to Full Cream pack at any stage during the design process. Here we pull out all the stops to bring you an impressive, informative and innovative website that is sure to be noticed. This package is indicative of the upper range we charge for website design. Your needs will no doubt differ to others and these packages are intended to give you a good idea for budgeting a project. Should you need more photography time, additional graphics or other services we can provide these with minimal additional expense. Be assured you'll get a very good website to promote your small business well within the range indicated here. A more accurate quote can be provided after your initial consultation if extra work is anticipated. Our sites are published using the web standards HTML and CSS. These are the most common and widely accepted website formats. They work with all the usual internet browsers on PCs, Macs, iPhone, iPad, Androids and more, all without special plugins or addons. The sites are also highly visible and readable by search engines. Hosting your site is fast and reliable. As the Easy CMS platform is interlinked to the host servers our sites must be hosted by us. For most people this is great because we continue to support the sites we've designed and the rates are especially competitive. Our Enterprise Hosting package will suit most small businesses with ample pages, space and bandwidth all for just $27+gst per month. If your business has a higher online presence and needs to accommodate higher traffic we have the Premier Hosting package for $49+gst per month which removes any limitations on speed and space for your site and includes email hosting if your domain is registered by us. Easy CMS is fantastically simple to learn and has no shortage of features. For an in depth look at our Content Management System have a look at our blog article Getting started with Easy CMS. We've even set up a live demonstration site you can log in to and try editing. We think you'll be very impressed just how easy Easy CMS is! We can also provide 'Static' sites which don't have the Easy CMS service. The hosting is even more affordable at just $13.50+gst per month, so if you don't need to edit your site this is a great option. We can later convert Static sites to Easy CMS sites fairly easily - usually less than an hours work. Changing from Easy CMS to static site is possible too but takes a bit more work. 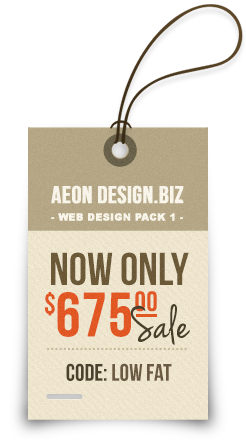 Aeon Design also provides Domain Name registration and administration services. Domain names carry an annual fee of $30+gst and we can also provide help with services such as email addresses, email hosting and Google Apps. We're here to help you - no matter what your level of computer expertise is. We'll provide training and advice as you need it. Use our experience and know-how to set up a solution thats perfect for your business. Our only affiliation is to our clients so you'll get independant advice which is focused wholey on assisting you.